Package includes: 3 hours of consultation, How to Manage Your Tea Room Effectively and 50 Special Events for Your Tea Room. Over $100.00 in value! Do you own or plan to own a tea room? Need some help getting started? Feeling stuck or alone? Concerned about your business plan? 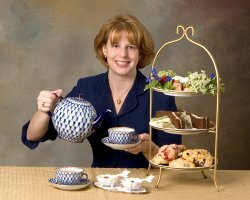 Concerned about tea room issues? Schedule a one hour consultation with me-Amy Lawrence. I owned and operated a tea room for 7 years, had a staff of 15 and sales of 1/2 M per year. I can tell you what to do, what not to do and give you ideas for running your tea room business. This is a pre-pay event. I will call or e-mail to confirm and set up your consultation time. Consultations are normally scheduled for 1 hour at a time. No refunds or credit will be given for cancellations of 24 hours or less or no-shows.